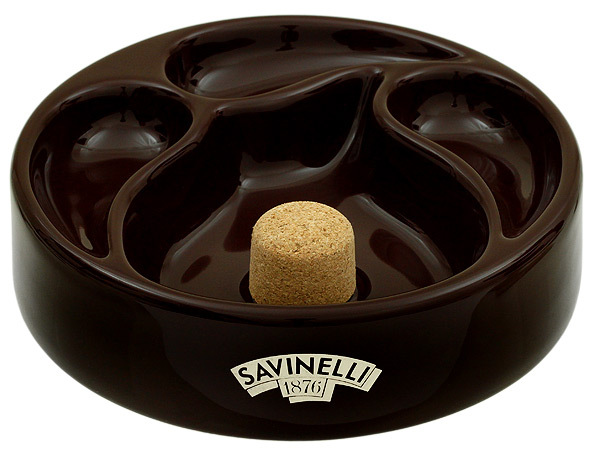 The latest addition to Savinelli's line of pipe accessories, this three-pipe rest/ashtray combo features a deep ash well, two interchangeable cork knockers, and three pipe rests set within the tray itself. Made from ceramic and available in three different colors (jet-black, milk-chocolate brown, and deep, forest green), these handsome, yet utilitarian designs are perfect for when company is over, be it entertaining guests or hosting pipe club meetings of your own. Measurements: H 1 3/4" W 7"